But there’s something a little clinical about this mix, too, and the roots of that can be found in the film. The Song One script is bogged down by a self-conscious desire for indie cred, with what feels like a checklist of alternative-indie influences dutifully noted. That includes the an unintentionally hilarious moment when a character briefly mentions the Beatles’ “Blackbird.” If Wayne’s World were remade today, that music shop sign would have to read “No ‘Blackbird'” instead of “No ‘Stairway to Heaven’,” and Song One proves why. 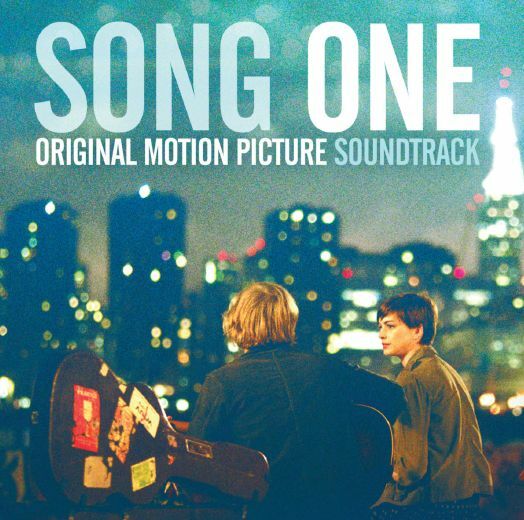 While half of the songs on the Song One soundtrack have been previously released, seven are new compositions by Jenny Lewis and Johnathan Rice, who also produced the album. Most of their songs are performed by actor-musician Johnny Flynn, whose calm, understated vocals perfectly match the whimsical, old-country tone. Lewis and Rice did a fine job of imagining these songs in the context of the characters, writing a slightly awkward tune for burgeoning musician Henry, confident songs for James’ hit album, and a tentative tune marking the moment James’ writer’s block begins to lift. Song One is an old-fashioned meet cute, but the light romance at the center of the film is a rather sketchy affair. Franny (Anne Hathaway) has been estranged from her family for months because she’s angry at her young brother Henry (Ben Rosenfield) for skipping college and becoming a musician. When Henry ends up near death, quite literally because of music — he had headphones on after a long day of busking and stepped out into traffic — Franny returns home, and still manages to get in a few zings about her brother’s bad choices. It’s implausible that Franny would end up in a romance with James Forester (singer-songwriter and actor Johnny Flynn), her brother’s favorite musician, and become his muse. In its way, Song One is shockingly out of date, like one of those programmers from Hollywood’s golden age that featured a paper-thin plot as an excuse to string together a few musical performances. The Felice Brothers, Sharon Van Ettin, Paul Whitty and more appear briefly in the film, and for most viewers, it’s these cameos that add real substance to the film. Being jerked away from the performances by smash cuts or being forced to stare at Hathaway staring at musicians she can’t manage to show any interest in may be so frustrating it almost wounds, but this soundtrack is the balm: a great collection of performances, with the music finally getting the respect it deserves.